The Western Australian Planning Commission (WAPC) controls subdivision of land in WA (ss.135(1) and 136(1) Planning and Development Act 2005 (WA) (P & D Act). 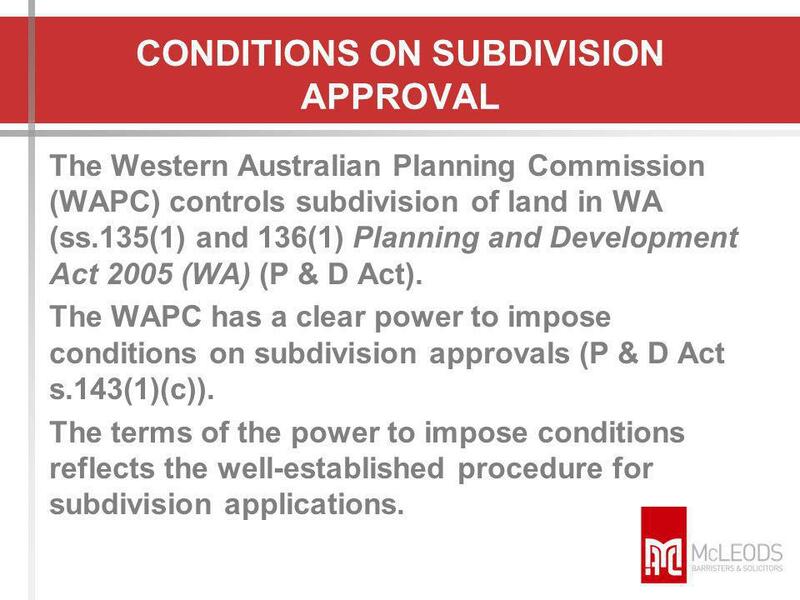 The WAPC has a clear power to impose conditions on subdivision approvals (P & D Act s.143(1)(c)). The terms of the power to impose conditions reflects the well-established procedure for subdivision applications. 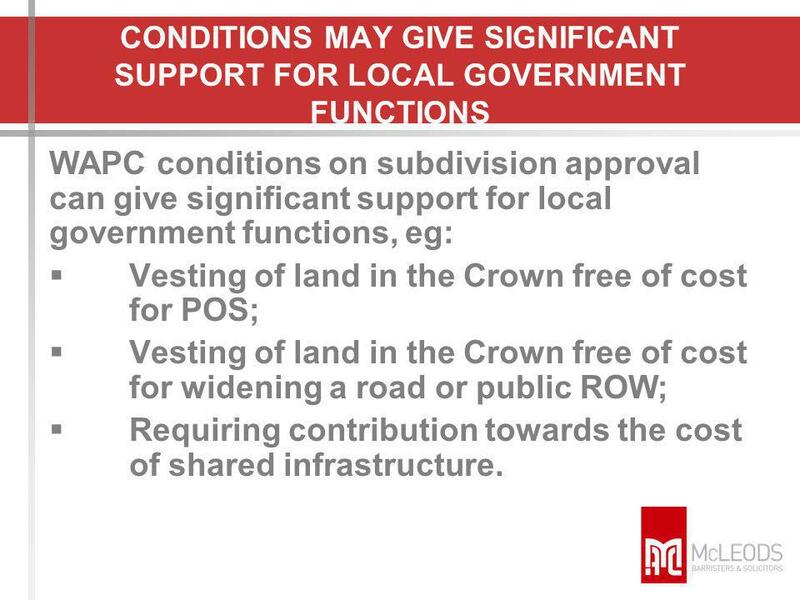 WAPC conditions on subdivision approval can give significant support for local government functions, eg: Vesting of land in the Crown free of cost for POS; Vesting of land in the Crown free of cost for widening a road or public ROW; Requiring contribution towards the cost of shared infrastructure. 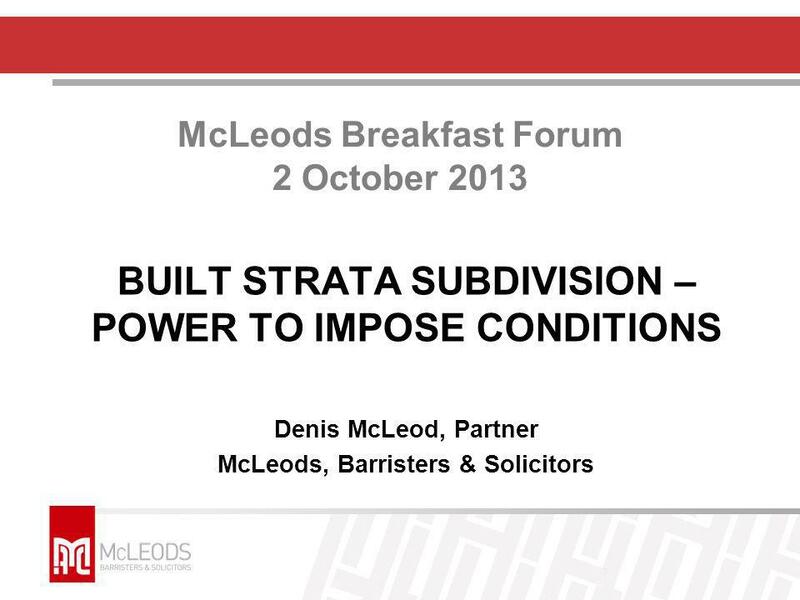 Local governments have (by delegation from the WAPC) been given control over strata subdivision under s.25 of the Strata Titles Act 1985 (WA) (ST Act). Over many years, the practice has grown of strata developments being built before application is made under s.25 of the ST Act for the strata subdivision certificate. 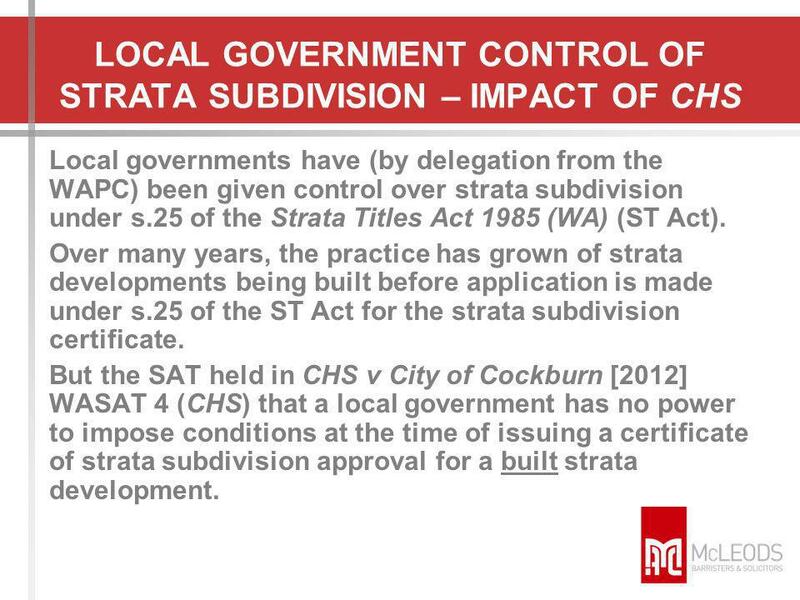 But the SAT held in CHS v City of Cockburn  WASAT 4 (CHS) that a local government has no power to impose conditions at the time of issuing a certificate of strata subdivision approval for a built strata development. 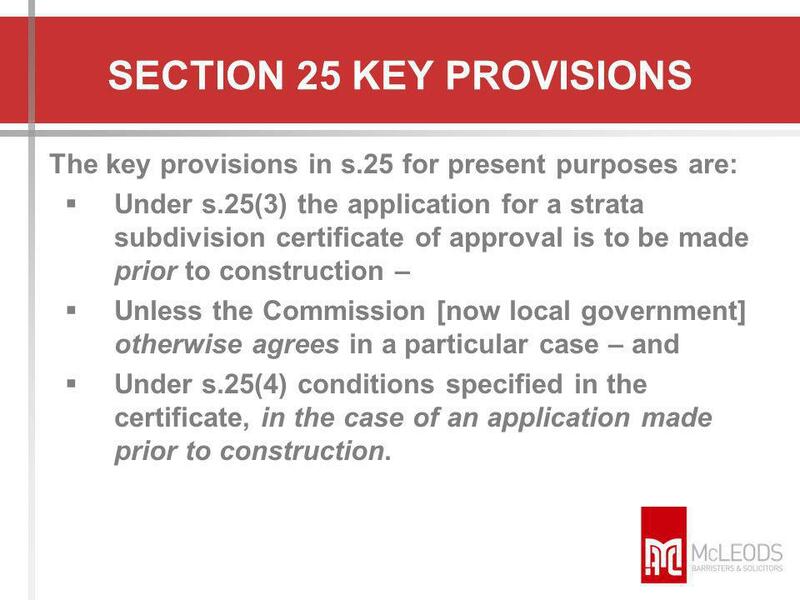 The key provisions in s.25 for present purposes are: Under s.25(3) the application for a strata subdivision certificate of approval is to be made prior to construction – Unless the Commission [now local government] otherwise agrees in a particular case – and Under s.25(4) conditions specified in the certificate, in the case of an application made prior to construction. 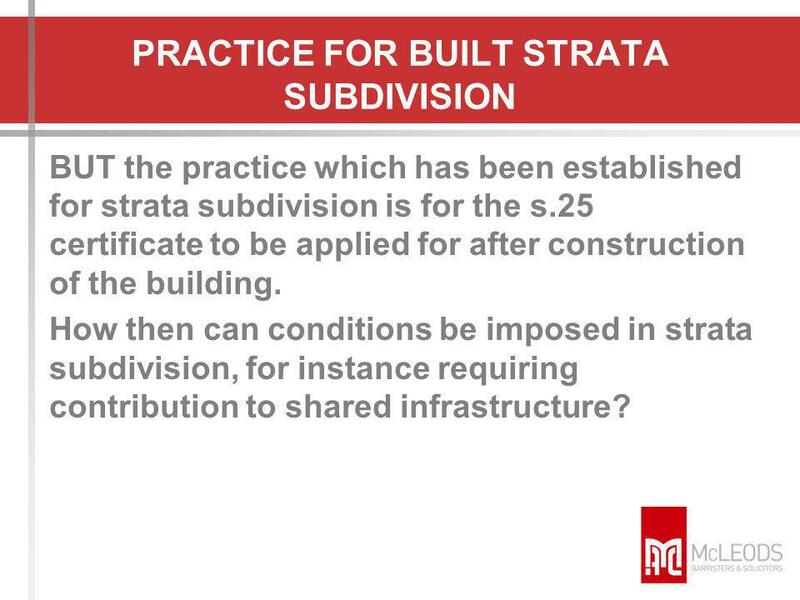 BUT the practice which has been established for strata subdivision is for the s.25 certificate to be applied for after construction of the building. 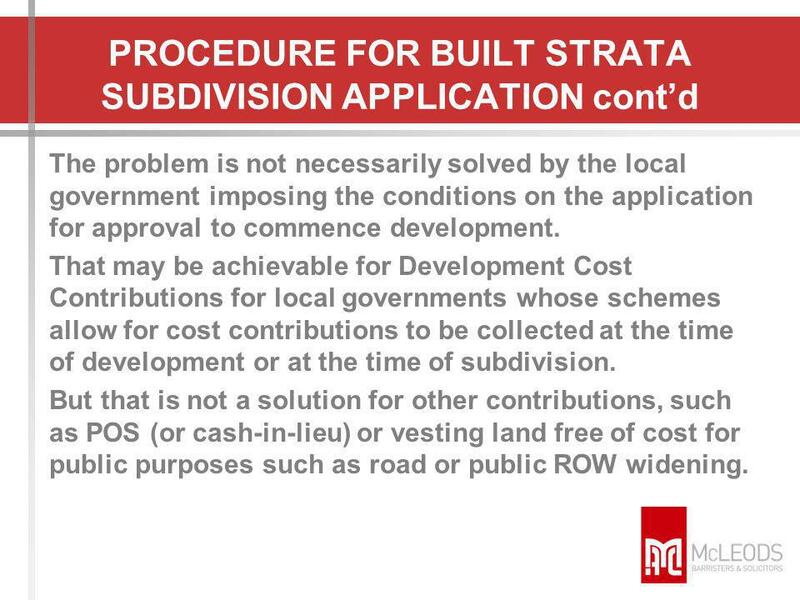 How then can conditions be imposed in strata subdivision, for instance requiring contribution to shared infrastructure? Where a subdivision creates new residential lots, there is a special need for the subdivider to make a contribution to the cost of shared infrastructure, such as POS, community facilities, and distributor roads. 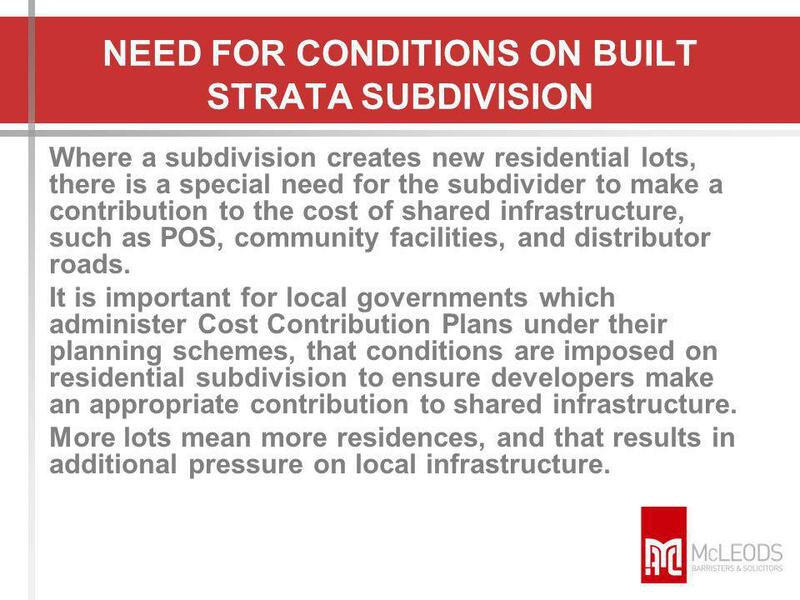 It is important for local governments which administer Cost Contribution Plans under their planning schemes, that conditions are imposed on residential subdivision to ensure developers make an appropriate contribution to shared infrastructure. More lots mean more residences, and that results in additional pressure on local infrastructure. Built strata subdivisions create new residences just as surely as green title or survey strata subdivisions. 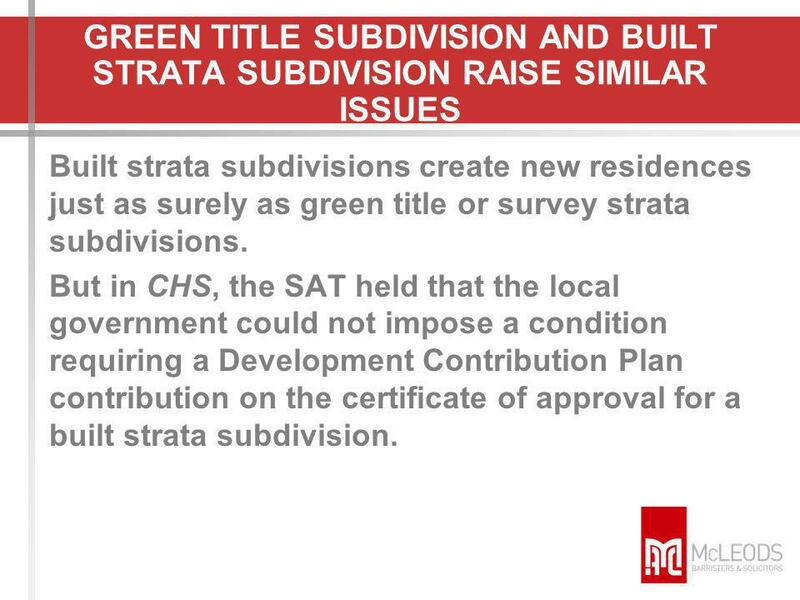 But in CHS, the SAT held that the local government could not impose a condition requiring a Development Contribution Plan contribution on the certificate of approval for a built strata subdivision. 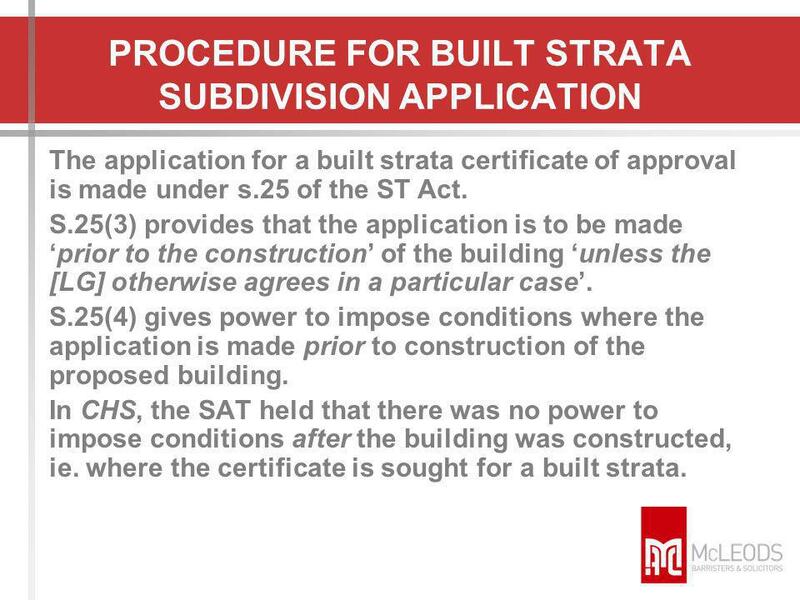 The application for a built strata certificate of approval is made under s.25 of the ST Act. S.25(3) provides that the application is to be made ‘prior to the construction’ of the building ‘unless the [LG] otherwise agrees in a particular case’. 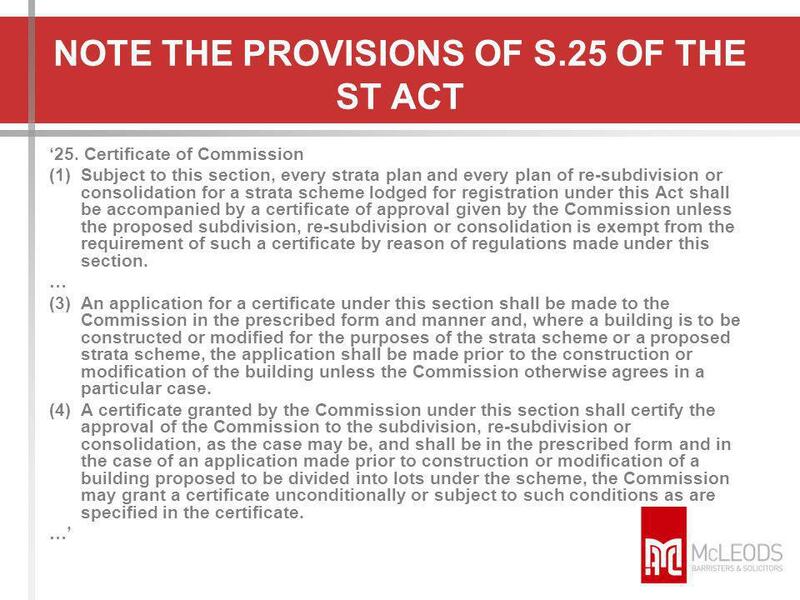 S.25(4) gives power to impose conditions where the application is made prior to construction of the proposed building. In CHS, the SAT held that there was no power to impose conditions after the building was constructed, ie. where the certificate is sought for a built strata. The problem is not necessarily solved by the local government imposing the conditions on the application for approval to commence development. That may be achievable for Development Cost Contributions for local governments whose schemes allow for cost contributions to be collected at the time of development or at the time of subdivision. But that is not a solution for other contributions, such as POS (or cash-in-lieu) or vesting land free of cost for public purposes such as road or public ROW widening. The problem with conditions aimed at sharing the burden of common infrastructure is that they are traditionally imposed at the time of subdivision. 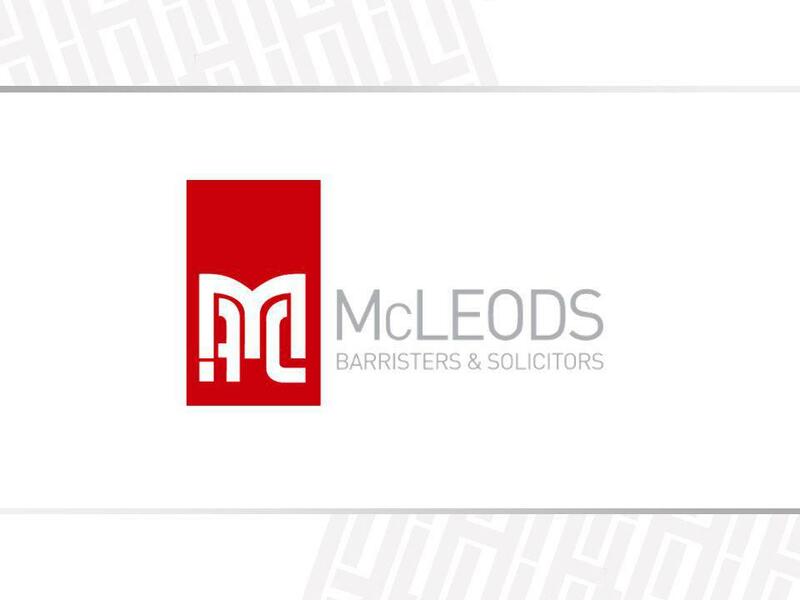 The SAT in Dalcorp Holdings Pty Ltd v Town of Victoria Park  WASAT 18 (Dalcorp No. 1) refused to impose a public ROW widening condition at the time of development approval, as it considered the nexus for such a condition was not present at that time, though it might be at the time of subdivision. What the SAT in Dalcorp No. 1 could not have been aware of was that the SAT would shortly afterwards hold, in CHS, that the local government has no power to impose conditions on the application under s.25 of the ST Act for an approval certificate for a built strata subdivision. 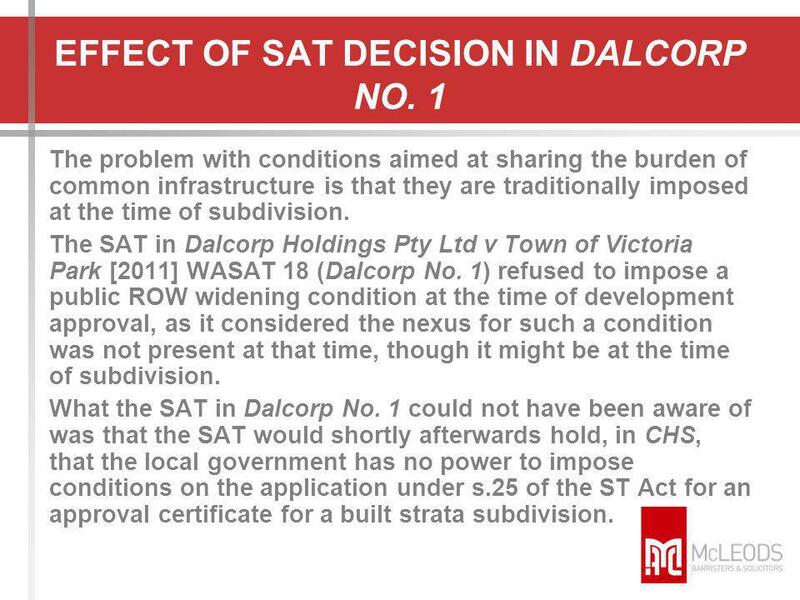 Local governments were placed in a bind by the combination of the SAT decisions in Dalcorp No. 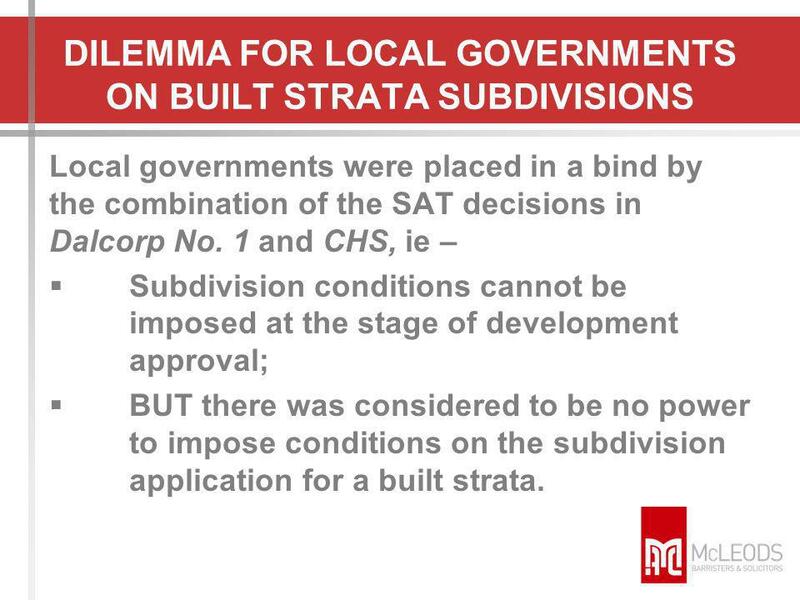 1 and CHS, ie – Subdivision conditions cannot be imposed at the stage of development approval; BUT there was considered to be no power to impose conditions on the subdivision application for a built strata. 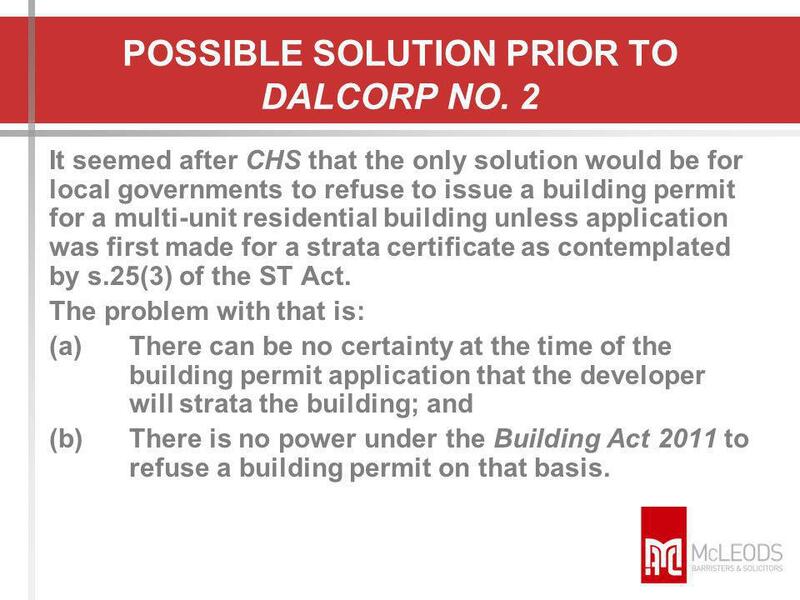 It seemed after CHS that the only solution would be for local governments to refuse to issue a building permit for a multi-unit residential building unless application was first made for a strata certificate as contemplated by s.25(3) of the ST Act. The problem with that is: (a)	There can be no certainty at the time of the building permit application that the developer will strata the building; and (b)	There is no power under the Building Act 2011 to refuse a building permit on that basis. 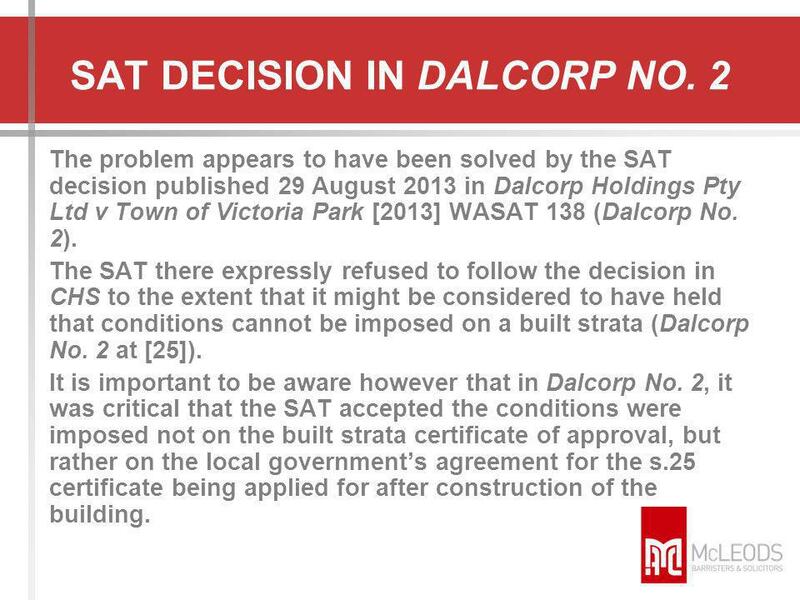 The problem appears to have been solved by the SAT decision published 29 August 2013 in Dalcorp Holdings Pty Ltd v Town of Victoria Park  WASAT 138 (Dalcorp No. 2). The SAT there expressly refused to follow the decision in CHS to the extent that it might be considered to have held that conditions cannot be imposed on a built strata (Dalcorp No. 2 at ). It is important to be aware however that in Dalcorp No. 2, it was critical that the SAT accepted the conditions were imposed not on the built strata certificate of approval, but rather on the local government’s agreement for the s.25 certificate being applied for after construction of the building. 16 PRECAUTIONS To take advantage of the Dalcorp No. 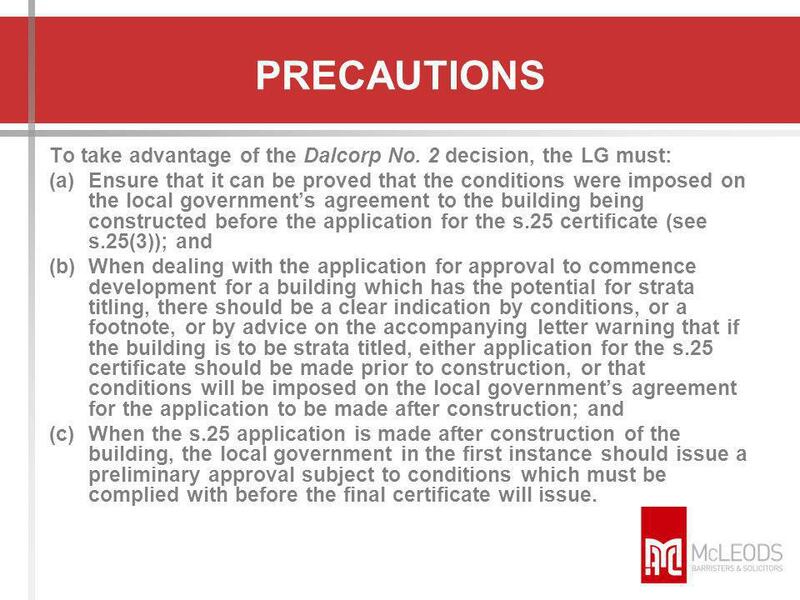 2 decision, the LG must: (a)	Ensure that it can be proved that the conditions were imposed on the local government’s agreement to the building being constructed before the application for the s.25 certificate (see s.25(3)); and (b)	When dealing with the application for approval to commence development for a building which has the potential for strata titling, there should be a clear indication by conditions, or a footnote, or by advice on the accompanying letter warning that if the building is to be strata titled, either application for the s.25 certificate should be made prior to construction, or that conditions will be imposed on the local government’s agreement for the application to be made after construction; and (c)	When the s.25 application is made after construction of the building, the local government in the first instance should issue a preliminary approval subject to conditions which must be complied with before the final certificate will issue. Download ppt "McLeods Breakfast Forum 2 October 2013"
Neighbourhood Planning - A Local Authority Perspective Beryl Guiver Principal Planning Policy Officer Tom Rice Planning Enquiry Officer. February 25, 2009 BCLS CPD Presentation STRATA PROPERTY ACT Brent Taylor, BCLS, CLS. Section 106 A Strategic Approach Peter Wilkinson Parks Service Manager Bristol Parks. A National Regulator Perspective on a Future Model for Vehicle Standards ComVec – 12 Commercial Vehicle Industry Association of Queensland Presentation. Presented by Glenn Tate IAPMO R&T Oceana Pty. Ltd.1. Proposed Land Use & Development Regulations Public Hearing Month Day, 2012. Neighbourhood Areas Presentation by Chris Hern 12-Oct-141Prepared by B. Sutkiene. Freedom of Information Act 2000 and the PCT Audit Procedure Background: The Act was passed in November The Act will be fully in force by January. Click to edit Master title style Click to edit Master subtitle style Planning CITY OF MELBOURNE. Easement presentation SSSI Spatial Summit SSSI Spatial Summit Land Victoria 2011 September 2011 Renato Marasco & Helen Lymbouris Disclaimer The content. Security of Payment workshop Andrew Robertson Important Disclaimer: The material contained in this publication is comment of a general nature only and. ADEQUATE PUBLIC FACILITIES ORDINANCE. What the discussion should include: 4 Adequate Public Facilities Ordinances (APFO) allow local governments to deny. Charging and Trading Powers Lawrence Graham, 15 th Nov 2006 Damien Welfare 2-3 Gray’s Inn Square. Retirement Villages : Best Practice Planning Friday 29 August 2008. Disclaimer The information contained in the nine (9) PowerPoint presentations is intended for general use to assist qualified Extension Officers to communicate.